"America's biggest rocket blasts off, likely carrying spy satellite"
A 235-foot-tall rocket carrying a top-secret spy satellite roared to life and blasted off from Vandenberg Air Force Base, leaving a thick white plume as it cut across the morning sky. The launch took place Wednesday at 11:03 a.m. PDT at the picturesque base, which is located along the Pacific Ocean. After countdown, the Delta IV Heavy rocket's three main engines ignited and climbed into skies. The hydrogen-fueled engines — each roughly the size of a pickup truck — were guzzling nearly a ton of propellants per second to provide 17 million horsepower. Although little is publicly known about what exactly the rocket will be carrying into space, analysts said it is probably a $1-billion high-powered spy satellite capable of snapping pictures detailed enough to distinguish the make and model of an automobile hundreds of miles below. 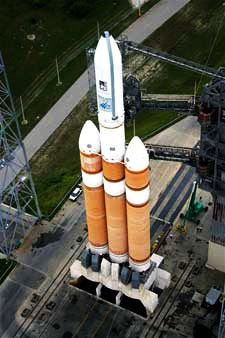 This is the second time that a Delta IV Heavy rocket was launched from the pad at Vandenberg. The first time was in January 2011.